This case study recounts the circumstances relating to a teacher faced with pending dismissal for alleged drug use based on erroneous interpretation of cocaine in hair test samples. This case illustrates the importance of applying a correct, peer-reviewed scientific methodology to laboratory analyses and interpreting the results in line with established facts and generally-accepted analyical procedures. A teacher employed by a Florida school district was required to undergo random urine drug testing after being treated for cocaine addiction in August of 2009. After returning to work in December of 2009, the teacher underwent the testing as required with negative results for cocaine. In May, 2010, another random urine test was performed; again, with negative results. However, the school district had erroneously ordered a five panel drug screen rather than the more intensive nine panel drug screen. The five panel drug screen included cocaine (which tested negative), marijuana (THC, cannabinoids), phencyclidine (PCP – angel dust), amphetamines (including methamphetamines) and opiates (codeine, morphine, and heroin). The teacher was asked to return to the laboratory later that same afternoon for the nine panel drug test. Unfortunately, he was not able to return to the laboratory before it closed for the day. An officer of the school district became suspicious that the teacher was trying to evade detection, so he decided to have a hair sample test performed on the teacher the next day. The hair sample resulted in a positive finding for cocaine. However, the teacher claimed that he had not used cocaine in the last eight months. Forensic toxicologists who employ the use of hair samples for drug testing purposes must have a rudimentary understanding of hair biology. Human hair consists of approximately 65-95% protein, 15-35% water and 1-9% lipids. Both essential trace elements and heavy metals can be found in human hair. 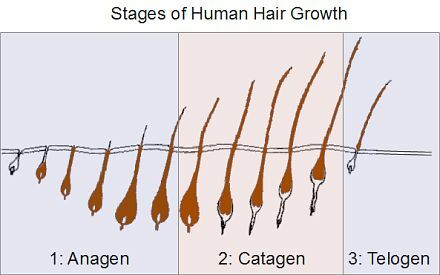 The human hair growth cycle consists of three stages. The "Anagen" phase is accompanied by an increase in metabolic activity. It is thought that drugs and trace elements are incorporated into hair during this phase. During the "Catagen" phase, cell division stops and the base of the hair shaft becomes fully keratinized. Finally, the hair follicle enters a resting period called the "Telogen" phase. During this phase, the hair shaft stops growing completely.1 A 1993 study by M.R. Harkey indicates that the range of hair growth rates reported for scalp hair is between 0.2 and 1.12 mm/day, or 0.27 to 1.53 inches per month. As a precaution, the study also notes that "although the growth rate is generally reported to be 1 cm/month, the growth rates found in the literature exceeds this range by five-fold." Per the teacher, the laboratory technician collected three samples of hair up to 1/2 inch long from old growth ends. The teacher reported that he had thin, "slow-growing hair" that was usually cut every 2-1/2 to 3 months by his barber. Deposition testimony of the barber supported this slow growth rate. At the time the hair sample was taken, the teacher was within a week of his next haircut. Photographs confirmed that the teacher had hair up to 3-4 inches in length. Based upon the generally-accepted peer-reviewed studies, the lower range of hair growth is approximately 0.27 inches per month. Thus, a hair length of only of 2.16 inches would have included hair produced nine months earlier. Unfortunately, the laboratory did not understand the concept of hair growth and incorporation of drugs during the Anagen phase of hair growth. If the laboratory technician had collected a hair sample close to the scalp, this sample would have represented recent hair growth rather than growth during the teacher's pre-treatment period of cocaine addiction. Following a hearing in which this information was provided through Dr. Sawyer's deposition testimony, the pending dismissal of the teacher from the school district's employment was averted. Although hair represents a valuable matrix for the forensic analysis of drugs-of-abuse, heavy metals and environmental contaminants, specific hair length measurements and growth rate knowledge are required to accurately approximate the date of drug incorporation. Harkey, MR, "Anatomy and physiology of hair," 1993, Forensic Science International, Vol. 63, pg. 9. "Procedural discrepencies are not always obvious. Objective assessment of drugs-of-abuse requires proper application of pharmaceutical knowledge, supported by appropriate, peer-reviewed analytical procedures."